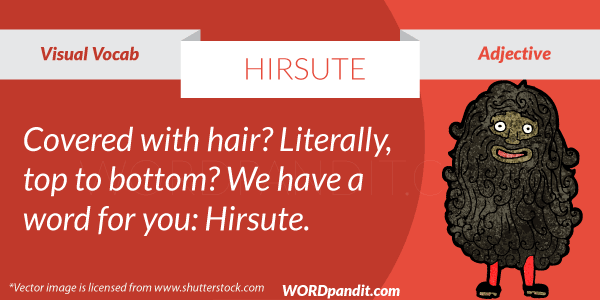 HIRSUTE may be remembered as SUIT OF HAIR. A person having a lot of hair on face or body is hairy and bushy. It looks as if he wears a suit (Indian apparel) of hair. Can you imagine that to remember the word? 1. Some of the hirsute men look scary. Synonyms: hairy, bristly, bushy, fleecy, flocculent, fuzzy.